Sunday, January 2. We rang in the new year fairly quietly, at home. Jennifer's Oma (grandmother) and Monica's boyfriend Toby joined Ursula, Jennifer, Monica, and me as we celebrated the end of a pretty-good year and the beginning of a better one. Earlier on New Year's Eve, on a walk around Lake Ella, Jennifer surprised me with about a half-minute of jogging. She said, rather matter-of-factly, that she was cold and wanted to warm up. She does need her naps, but can do quite a bit when she's out of bed and her stomach isn't bothering her. Yesterday Jennifer's Cousin Elisabeth and Elisabeth's husband Danny came to town for a few days, and we all enjoyed catching up on their activities. Jennifer's friend Lisa has also been here (from Boston), and they went shopping for bridesmaid dresses for Lisa's wedding in August. Sunday, January 9. Jennifer continues to get stronger, although fatigue is still a problem. She can walk briskly once or twice around the 2/3 mile perimeter of Lake Ella with Ursula most days, although she needs to relax afterwards with an Italian soda or hot tea at the coffee house next to the lake. Yesterday Jennifer drove Monica and me to a nearby mall and back. This was the first time she has driven in 21 months, but she had no trouble at all. Jennifer's hair is now long enough that she's thinking about getting a bit of a trim to keep it neat. In general, things are pretty routine: Ursula is with Jennifer during most of the day, and it's my turn in the evening (with help from Jennifer's Oma in keeping Jennifer well fed at suppertime). Jennifer is now completely off the anti-seizure medication, with no ill-effects. This is no doubt helping her energy level, and being more active should help her general feeling of well-being. She also no longer takes an appetite stimulant, which had been necessary to make sure she ate enough to keep from losing more weight. She gets plenty hungry enough on her own now. Sunday, January 16. It's been a quiet week for Jennifer, and we continue in our usual routine. Her energy level isn't up to where we'd like it, but she manages. 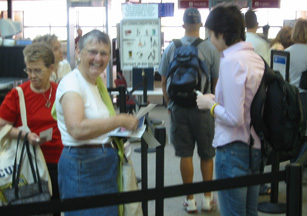 We saw Monica and Toby off at the airport on Tuesday. They're at an orientation at a ski resort near Vienna now, and will start regular classes later. Today Jennifer, Ursula, and I went to see the Phantom of the Opera, and we all enjoyed it. Sunday, January 23. Jennifer has had a good week. Cold weather has discouraged her from walking a lot, but she has had a good time anyway. She enjoyed seeing her Tante Gisela and Onkel Wolfgang, who came down from Ohio and stayed in Tallahassee for a few days, and her cousin Ulli, who also lives in Ohio, also drove down and stopped in. 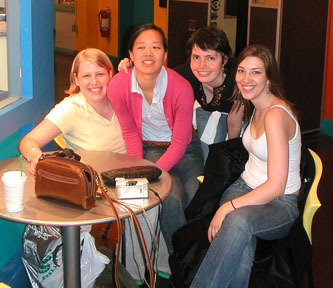 She went to a movie with her friend Lauren, and as usual, talked frequently to Winston (who is still at Harvard working on a master's degree). She is also starting up her knitting again. Jennifer is generally eating well, if not in large quantities. She and Ursula often go out to lunch, and Jennifer and I usually enjoy her Oma's cooking on evenings when Ursula is teaching. This week Ursula and Jennifer were invited out to lunch with Judy, mother of Jennifer's friend Katie (whose picture is on the left side of this page). Saturday Jennifer and I went to a lecture at Native Nurseries on how to attract birds to your yard. On a tree outside her window Jennifer already had a bird feeder (which has also served to feed many squirrels and at least one racoon), but after the lecture we mounted the feeder on a pole away from trees, and hope to reduce the non-bird visitors. Jennifer enjoys spotting and identifying the birds she sees out her window and on walks around the lake. Sunday, January 30. Another good week for Jennifer. We have had enough cold and rainy weather to discourage a lot of outside walking, but she has managed to get some exercise by going shopping occasionally. She and Ursula also went to Maclay Gardens for a picnic lunch near Lake Hall. This afternoon the three of us went to Lake Ella, and went around twice (with a tea break at the Black Dog Cafe in between). New blood counts this week showed Jennifer is still not up to where we want her to be, but they're high enough that we're not concerned about them. Jennifer has been really getting into The Legend of Zelda on a Nintendo GameCube that Winston gave her last year. Recently he also gave her a dance pad (it's a floor mat that connects to the GameCube), and dancing on it according to the Nintento instructions is fun and good excercise, too. 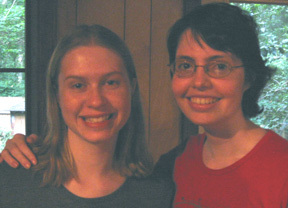 Other fun things this week: playing the piano (we haven't heard enough of that in recent months), movies with Ursula and me, and with Lauren, and a letter from her friend Liz (a classmate and dormmate from Smith College) with snapshots from the good old days. The bird feeder on a pole outside Jennifer's window is working well. Squirrels seem to think that the pole is about to break when they climb near the top, not knowing that it's a thick-walled PVC pipe that bends quite a bit without breaking. There weren't many birds on the feeder during the cold rainy days this week, but this morning the sun came out and the feeder was mobbed by up to half a dozen birds at a time, three different species. Sunday, February 6. The big events this week involved visiting with Katie, Jennifer's old friend from Leon High School who is also recovering from treatment for a brain tumor. 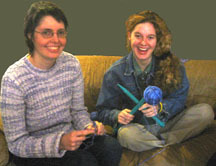 Katie came over Monday and she and Jennifer knitted and caught up on what's going on in their lives. Tuesday Jennifer went over to visit Katie at a friend's house. It's still too cold for Jennifer to want to do much outside walking, but she continues to get some exercise by going shopping occasionally. Sunday, February 13. 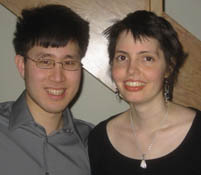 Jennifer has been in great spirits this week and, not coincidentally, Winston came down from Cambridge late Thursday. They've been shopping, walking around Lake Ella, going out to dinner and a concert, seeing movies, and generally having a good time. They also painted the pole for Jennifer's bird feeder a more natural color. Tonight Ursula and her mother and I, and Winstons's father, will all go out to dinner with Winston and Jennifer. Sunday, February 20. Winston went back to Massachusetts Monday. Jennifer has still been visiting with friends, however, including Lauren (who still lives in Tallahassee) and Erica (who came back to town from Gainesville for a visit). The weather has been warm (for February), and Jennifer has been doing her Lake Ella circuit nearly every day. Yesterday she and I went shopping for some good shoes for walking in the snow (in Vienna). Sunday, February 27. It's been a fairly quiet week. Jennifer has had a cold for several days, and it's keeping her pretty house-bound and limiting her appetite. She does seem to be feeling better today, and we're assuming she'll be in fine shape for our Vienna trip. Monday, March 14. We're back home, after 8 days in Germany and Austria. First we flew to Frankfurt and visited Ursula's warm-hearted and generous relatives in the Frankfurt area. Then we took a train to Vienna and visited Monica, who is having a wonderful time as a student there for the semester, as is Toby. After several days there we took the train back to Frankfurt, and after another fun evening there we flew back home. Jennifer recovered from her cold and sniffles, in time to experience the cold and snow of Europe in March, but still was not up to doing a lot of sight-seeing. She also had a short seizure in Vienna, but recovered from it quickly and had no long-term effects from it. Throughout the trip, Jennifer managed to eat very well—with all of the excellent food offered us in Germany and available in Vienna, it wasn't hard to eat very well. Saturday, March 19. Good news! 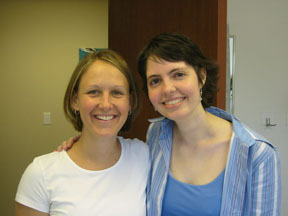 Jennifer's MRI this week showed NO tumor increase, and even a possible decrease in tissue that may be tumor-related! We had to call Jennifer to give her the good news, as she already left Thursday for Cambridge (Massachusetts), for a visit with Winston. We were all tired after the big trip, especially after the flight back to Tallahassee was delayed and didn't arrive until nearly 1:00 Sunday morning, but we're recovering well and certainly are glad we went. 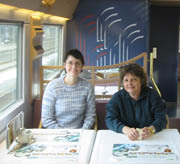 Happiness is eating well: with Ursula in the dining car on the train to Vienna... And lunch in a restaurant in Vienna with Ursula and Monica. Sunday, March 27. Jennifer is enjoying her visit with Winston in Massachusetts. They were in Cambridge until today, as Harvard's spring break is next week. They leave for Cape Cod today. She sounds great on the phone. Sunday, April 3. Jennifer is still visiting Winston in Massachusetts. They got back to Cambridge from Cape Cod at the end of the week, and she'll be leaving for Tallahassee Tuesday afternoon. She seems to be having a great time, in spite of some cold and rainy weather. Sunday, April 10. Jennifer enjoyed her visit with Winston in Massachusetts, in spite of some cold and rainy weather. She got back in fine shape, in fact she's feeling better than she has in months. Her energy level is up, and she's more active and for longer than before. Yesterday Jennifer and I went out to brunch, did some shopping, walked twice around Lake Ella, and washed the car before taking a break. Even then she just relaxed and didn't need a nap. After dinner Ursula joined us for a trip to the mall to see "Robots," and they were still up when I went to bed. Sunday, April 17. Jennifer had a mostly good week. She and Ursula did some shopping, and enjoyed several trips around Lake Ella in the spring sunshine. Yesterday Jennifer and I went to Lowes for a light fixture that I'll put up by her outside door, and then we looked for at Lowes and at Esposito's Nursery for flowers to plant outside her door. Yesterday evening she went out for dinner with her friend Lauren, but she came back early not feeling well. This morning she had a seizure, similar to the one she had last month in Vienna. She took it easy the rest of the day, and feels better now. We expect she'll be back in good form tomorrow. Sunday, April 24. It's been a good week. Jennifer has been enjoying the cool and sunny weather, with brisk walks around Lake Ella most days—often two trips around at a time. Yesterday she and I did some yard work after Lake Ella, and she went to a movie with Lauren in the evening. Today Jennifer, Ursula, and I went out to lunch, and then went to Lake Ella again. Sunday, May 1. Jennifer has had some good medical news this week. First, her opthamologist says her left retina is much better now. It had been bleeding, probably as a result of the radiation she received last year, but the retina is in much better shape now. Jennifer also got her blood cell counts checked again, and the red & white cells and platelets are all either in the normal range or almost there. 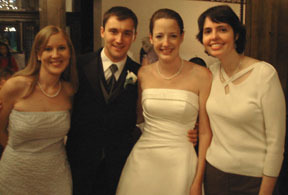 The big social event this week was the wedding of two long-time friends of Jennifer's, Mary and Allen. Ursula, Jennifer, and I all went, and in addition to the happy couple we were able to catch up with other old friends including Mary's parents, Richard and Janet, Jennifer and Mary's friend Courtenay and her parents, Raoul and Linda, and her husband Louis, and many others. Jennifer is also moving ahead with her spring travel plans, and bought a new bathing suit yesterday. Sunday, May 8. 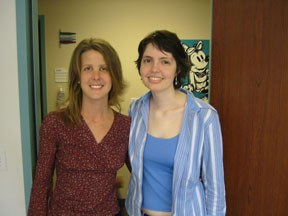 Jennifer had a good visit to Gainesville Monday, which happened to be exactly two years after her first surgery. We had the latest (and very good) MRI results already in late March, so the visit was mostly for her doctor to examine Jennifer directly and talk to her about how she's feeling, and make sure she is ready for some extensive traveling. The only change is that Jennifer will be taking some anti-seizure medication again to make sure she has a smooth trip. Back home, it's been quiet. Jennifer is getting a lot of rest, along with regular brisk walks around Lake Ella. Today we're all (the three of us and Ursula's mother) going out to dinner to celebrate Mother's Day. Sunday, May 15. 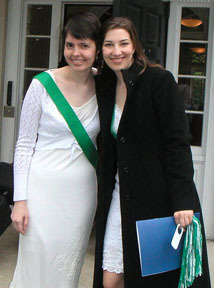 Jennifer spent the early part of the week packing, but did manage to get together with her friend Lauren. Jennifer got up early (for her) on Thursday and went to the airport. There she ran into one of her teachers from Temple Israel Preschool, Miss Emily. 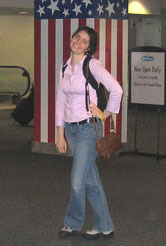 Jennifer was on the plane by 10 am, and arrived safely in Boston by mid-afternoon. Friday she rode with Liz, a friend and fellow Smith graduate, to their two-year reunion at Smith College in Northampton, in western Massachusetts. Smith has a reunion every year, for all graduates who want to be there. Jennifer's spending the weekend at Liz's cousin's Bed-and-Breakfast, enjoying all of the reunion festivities. We're hoping she'll send us some pictures. And she had a great time at the Smith reunion last weekend. I'll be putting more pictures on our WebShots pages. This week Jennifer mostly just took it easy in Cambridge and Boston while Winston worked on his Masters project. She did manage to get in some shopping with Lisa and Denis (Jennifer will be a bridesmaid at their wedding in Tallahassee later this summer). Sunday, May 29. Jennifer is with Winston in the Turks and Caicos Islands, part of the British West Indies (between the Bahamas and Haiti). She had to get up at 4 in the morning to catch the flight from Boston, and we're hoping the rest of the trip is a little more relaxing. Sunday, June 5. 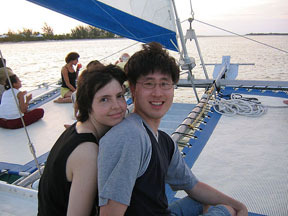 Jennifer and Winston made it back on Wednesday from the Turks and Caicos Islands, where they had a great time. Winston posted snapshots of their week HERE, and one of them is also shown below. They are in Cambridge now, getting ready for the Harvard commencement ceremonies. Sunday, June 12. Jennifer went with Winston, his parents, and his two brothers to the Harvard commencement ceremonies Thursday. He received his Masters degree in a computer-related field (don't know exactly what). Today they are leaving for their trip to Europe. On the phone Jennifer sounds very happy and says she is feeling good. Sunday, June 19. Jennifer and Winston had a great time in Frankfurt with Ursula's relatives, and made it to Prague by Wednesday. They may be in Italy by now. Sunday, June 26. Jennifer and Winston are engaged! He asked her Monday in Rome, and she accepted. They haven't yet set a date for the wedding. Other than an unfortunate encounter with an Italian pickpocket, they have had a wonderful time in Europe. They should be in Paris now, and about to come home.